Essence Got A Secret with China Glaze Papaya Punch and BornPrettyStore triangle glitters. My camera picked up the orange better but showed the grey too light. But I took a pic with my phone to show this mani to my boyfriend, and as it turned out, my phone captured the grey well, but the orange too dark :P Instead of messing around more with my camera to get the right settings, I figured to just show both pics :) I do like the look of this mani, but I know myself well enough, glitters that stick out won't last long (can you resist picking them off?) and when a mani looks a bit thick because of the amount of layers, meh. 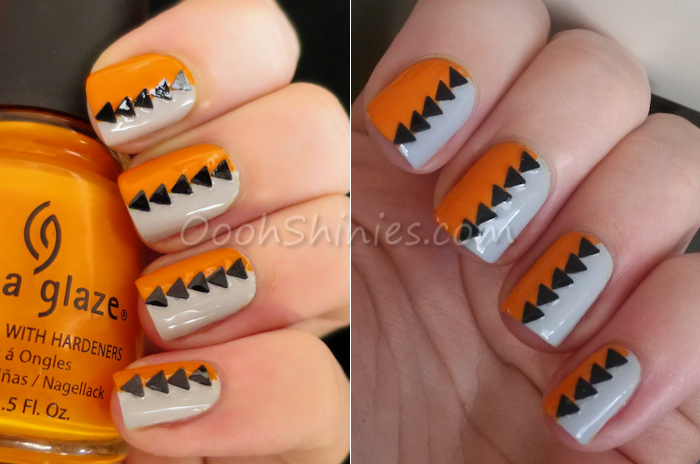 Sooo, if I'd wear this kinda combo again, I think I'd be back to stamping, haha! The triangle shaped glitters come in little jar like a lot of BPS glitters, and just like most of their glitters, they come in a bunch of colors as well. It felt like some glitters were thicker than others, but as I quickly found out, that was because there were several still sticking together. Rubbing them between my fingers sorted that easily! You can find the glitters here, a little jar costs $2.53, and you'll get 10% off with code ABJ61. Hope you'll have a lovely weekend, take care!